Mini's high-performance JCW Countryman joins an impressive lineup of faster and more powerful enthusiast models. 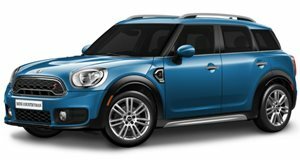 Ever since its initial debut, the Mini Countryman has been an interesting model for the automaker. Only known for building small cars, the Countryman is roughly the size of the Nissan Juke and has respectable off-road capabilities. Even a highly modified Countryman took part in the recent Dakar Rally. As for any Mini model, a high-performance John Cooper Works version is eventually launched. For enthusiasts, the JCW models are simply their only Mini option. The automaker is aware of this and they&apos;re hoping for continued success with the new JCW Countryman. Set to make its global introduction at Geneva next week, the JCW Countryman will be fitted with the All4 all-wheel-drive system and will be powered by a newly developed 1.6-liter four-cylinder twin-scroll turbocharged engine with 211hp and 207lb-ft of torque. There&apos;s also an Overboost function that briefly pushes torque up to 221lb-ft. Buyers will have a choice between a six-speed manual or, for the first time on a JCW model, a six-speed automatic slushbox. All told, the JCW Countryman can go from 0 to 62 mph in 7.1 seconds, while returning an average fuel consumption of 39.2 mpg in European test cycles. Chassis technology includes a front axle with MacPherson struts, central-arm rear axle, Electric Power Steering, and a standard sports suspension with stiff spring and damper settings, strengthened anti-roll bars and a lowered ride height. 18-inch Twin-spoke alloy wheels are standard while 19-inchers are optional. The interior is equipped with sports seats in a unique Diagonal Track Carbon Black cloth trim with red contrast stitching. Buyers can also opt for leather trim. Throughout the cabin there are red trim elements and the door panels and center console come in standard Piano Black. Added to this package is a sports steering wheel with red contrast stitching and the JCW logo. Final touches include a dark speedometer and rev counter dials, anthracite-colored roof liner, and a gearshift lever with red shift pattern lettering. Neither official pricing or an on sale date has been given, but we&apos;ll likely receive these details in the coming couple of months. In the meantime, you can check out these official photos released by Mini and we&apos;ll have more details shortly from Geneva.